Last April was such a cruel month. The relationship between South and North Korea has never been worse and social discord has increased. Measures and solutions presented by the government did not look promising. PSPD office was busy like a bee. • North Korea has faxed a proposal to the PSPD on 1 April, if we can call it a proposal. The People Reconciliation Consultation, a North Korean organization defined the current situation a ‘time of war’ and suggested to confront together against the US. The secretariat office reported it to the Ministry of Unification accordingly to the procedure and presented an opinion that social organizations in South and North should try to work for dialogues and cooperation not disputes and discords. • On 11 April, 50 representatives from civil, social and religious organizations including PSPD held an urgency press conference to urge both South and North Korean government and the US to immediately stop provocative military threats and resume unconditional dialogues and cooperation. The participants agreed to organize a conference (abb. Korean Peninsula Peace Conference) in May in which people from various fields sit down and work for the peace and cooperation of Korean peninsula. • PSPD is helping the establishment of suprapartisan group which will promote the peace in Korean peninsula. As a secretarial organization for Korea division of ‘Parliamentarian for Nuclear Non-proliferation and Disarmament (PNND)’, PSPD assisted mapping out a suprapartisan joint letter which forwarded to the President Obama under the name of 56 parliamentarians. The letter completed thanks to efforts of Lee Mi-kyung, a member of Democratic United Party and Jeong Eui-hwa, a member of Saenuri Party recommends the US and North Korea to commence comprehensive dialogue based on six-party talks agreement. It is rare to see collaboration between a leading and opposition party. • PSPD is making a proposal to international peace organizations to hold ‘Global Day of Action to End Korean War’ in the cities all around the world on coming 27 July, the day of the 60th year of armistice. • The police released investigation results on 18 April in regard to ‘National Information Service employee’s intervention in the presidential election’. The Center for Administration Watch of PSPD denounced the results as a typical minimized investigation which tried to close the case by cutting off the tail and, urged the prosecutors’ to execute thorough investigation. PSPD will never loosen the pressure to find the complete truth. • The Public Interest Law Center of PSPD has lodged constitutional appeal on 4 April for a toxic article in Telecommunications Network Act which allows punishments for defamation on mentioning even facts on internet. The center analyzed defamation or damage suits brought by government officers against ordinary citizen who criticized government’s administration and policies and, published a report on <Abusing lawsuits to shut people’s mouth> on 2 May. • For the trial of appeal case which PSPD has indicted Korean Communications Commission to disclose prime cost for mobile phone charges, PSPD once more won the case secondly to the first hearing. The court partly upheld PSPD’s arguments. • At the scene of forced eviction of memorial site for Ssanyong Motors workers at Daehanmun, demonstration for not to close down Jinju Clinic, Golden Bridge labor union’s strike, struggle of convenient store franchisees and Gangjeong village Naval base construction site, we were there with them who have been repeatedly kicked out and forced away. Why my data on mobile phone subscription are in the hand of the Police, the Prosecutor’s? Indicted three mobile communication service providers for damages on the charge of handing over personal data to investigators and failing to notify subscribers. Netizen(a person who regularly uses the internet) C received a phone call from the Police in March 2010 and was requested to come to a police station for questioning. The Minister for Culture, Sports and Tourism sued him for defamation for uploading a movie on internet community. Only ID is disclosed on internet bulletin but concerned Internet Portal supplied his data to the police including the name, identification number, phone number and application date (called ‘communication data’ in Electric and Communication Business Act). According to statistics released by Korean Communications Commission in 2012, investigators have received 395,061 subscribers’ personal information and 3,856,357 phone numbers only in the first half of 2012 from mobile communication and portal providers. They were handed in without consent of subscribers and even worse, notifications were never made afterwards. Hence, Netizen C and the Public Interest Law Center of PSPD indicted the Naver for damages on the charge of providing personal communication data without consent and the high court decided compensation of 500,000 KRW in December 2012. After the decision, the three largest portals made clear their stand not to respond to investigator’s request on submitting communication data without a warrant. However, mobile communication service providers haven’t said a word so far. Meanwhile, the Public Interest Law Center of PSPD and citizens started a joint action for making an individual inquiry to communication companies whether personal information has ever been submitted to investigators. Article 30 of [Utilization of Telecommunication Network and Information Protection Act] states that an individual who uses electric communication business has the right to know whether personal information has been provided to the third party and which information if provided. Despite the law, three mobile communication service providers refuse to disclose or do not respond on the request of what and which personal communication data have been handed in to investigators. Therefore, the Public Interest Law Center of PSPD has litigated three mobile communications for damages and submitted a complaint letter to the Privacy Protections and Ethics Division of Korea Communication Commission. The Center said “With this litigation, we expect to seize the practice of mobile communications to provide their customers information easily on request and furthermore, to create the practice of disclosing and notifying their customers in case of provision. Jinju clinic is a public and main hospital in the region which is established by the state and a regional government in order to carry out the responsibilities of securing lives and the health of the people. However, Gyeongsang Nam-do government announced to close down Jinju clinic on 26 February and decided to suspend the business on 3 April. Doctors suddenly received a notice for terminating work contract. All in-house patients were asked to transfer to other hospitals. Regrettably, a few patients lost their lives in the course and, most of discharged patients could not be transferred and left out. For two months since the close-down announcement, 22 patients have been dead while suspension period was extended without having discussions how to bring the hospital back to normal. Even though regional governments are obligated to support and promote public hospitals and provide subsidies for operating expenses to regional main public hospitals, Gyeongsang Nam-do government decided to shut down Jinju clinic on the ground of debts and deficit of four to six billion won. What has to be considered is that major part of operating deficit is incurred from the debt for new building construction in 2008. It is also ‘Sound deficit’ caused by providing medical services for public interests such as pandemic response, medical services for the poor and minorities and emergency service which private hospitals can not afford. Moreover, portion of public hospitals in Korea is merely 7%. It reaches to only 70% of OECD average that Korea needs more public hospitals. Taking care of public hospitals is what the state and regional governments have to do at least in order to secure people’s right to health. 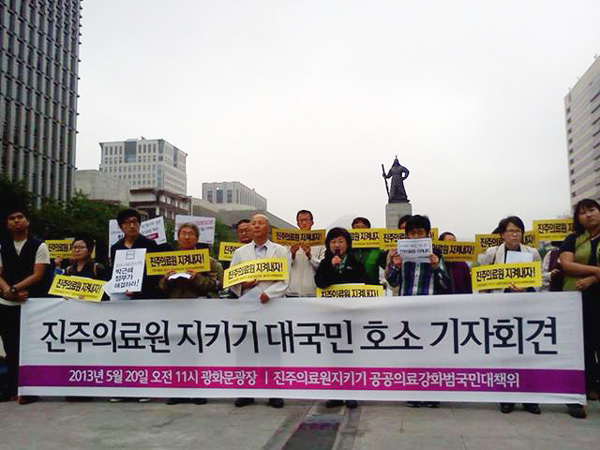 However, Gyeongsang Nam-do government hasn’t done anything visible to reinstate Jinju Clinic until now. Teletubbies appeared at Yeouido, Seoul! On 15 April when discord and tension between South and North Korea rocketed, over 140 events of Peace Action were carried out on the 3rd Global Day of Action on Military Spending in more than 60 countries around the world including Seoul. 24 civil organizations including PSPD and 15 parliamentarians held a joint press conference in front of the National Assembly in Yeouido and demanded to resolve tension in Korean peninsula with dialogue and cooperation instead of nuclear and armed forces. 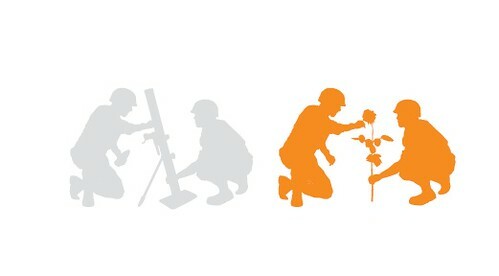 The Global Day of Action on Military Spending has started in 2011. On the day when SIPRI (Stockholm International Peace Research Institute) releases a report on military spending every year, peace actions are organized spontaneously in various regions around the world. It is to urge states to spend budgets for places where actually in need rather than consumable arms and defence. According to SIPRI report, Korea ranked in the 12th largest military spender and the second biggest arms importer in the world in 2012. The US spends 40% of world military spending and six-party talk participants occupy 60% of the total. At the joint press conference crying out for both South and North to disarm for peace, Civil organizations and parliamentarians have made five suggestions ▲ Sustain current spirit of consensus and list of agreements ▲ Discard policies relying on nuclear deterrent and declare Korean peninsula a non-nuclear state ▲ Reduce military budget and increase investment in welfare ▲ Never use inhumane weapons ▲ Agree on peace treaty and disarm. Moreover, joint statement prepared by Korea and Japan civil society was presented and it proposed followings. △ Establish Northeast Asia a non-nuclear region and stop developing and deploying Missile Defence System not only for the settlement of North Korean nuclear matters but furthermore for the peace of Northeast Asia △ Withdraw the construction plan of Jeju Naval base and phase out US bases in Okinawa, Japan △ Resolve territorial disputes between nations by means of peace talks and Japan should sustain Peace Constitution. After the Press Conference, the Peace and Disarmament Center officers of PSPD and peace activists held a campaign “South and North, Let’s disarm for peace” in Yoonjoong Road, Yeouido where fevered up with cherry-blossom festival and cried out for citizens to step forward for the peace in Korean peninsula. The campaign gained huge attentions and supports from the public and a thousand fans made to promote ‘Cool down both North and South Korea!’ were all gone in two hours. Citizens shouted “South and North, Let’s disarm for peace” to members who dressed up in South and North soldiers. When they put down guns on the ground and hugged each other, people cheered and clapped. The most popular performance was members wearing teletubby costume. 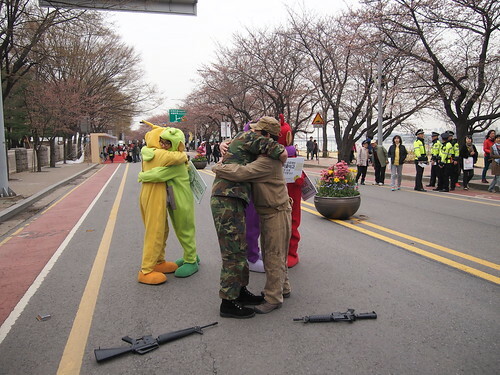 Parodying teletubbies characters, ‘Pacific teletubbies’ satirized arms race in Northeast Asia was made in a movie and received good feedback in Youtube.